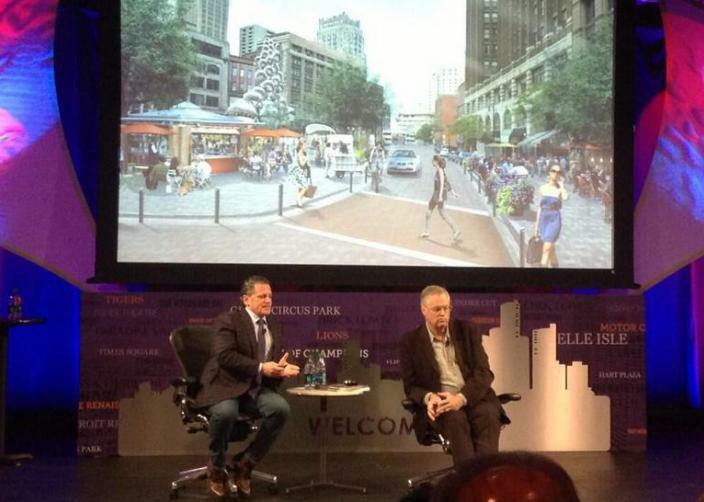 You may have heard about downtown Detroit's big comeback story. Campus Martius has become one of America's great urban squares. Demand for housing has outstripped supply for months. Major tech firms like Twitter are opening up offices in refurbished historic buildings. The Motor City's historic core is ascendant. Yesterday, at an event hosted by Dan Gilbert of Rock Ventures LLC, downtown Detroit became the Rust Belt comeback kid to watch. Gilbert, who moved thousands of employees downtown from his company Quicken Loans' former headquarters in the suburbs, has bought more than a dozen downtown properties in recent years and is deeply invested in the revitalization of the district. He is a new kind of visionary who understands the fundamental value of great places, and the need to work with his fellow citizens to shape the city's future together, rather than imposing a singular vision from the top down. The movement that he has built is about turning everything in Detroit up-side down and reorienting the role of each player, from pedestrian to CEO, to maximize their contribution to the shared experience of the city. Our own involvement in that movement began last September, when PPS joined Terremark Partners, Shook Kelley, and Gibbs Planning Group for a charrette organized by Rock Ventures. "We proposed developing a Placemaking vision for the major public spaces, and refining the plan through the Power of 10 concept," says Meg Walker, a Vice President at PPS who worked on the project. "That's been a key factor from the start. A lot of developers aren't as enlightened as Dan Gilbert...they wouldn't necessarily think about the glue that's holding this all together." The Power of 10 framework suggests that a great city needs at least ten great districts, each with at least ten great places, which in turn each have at least ten things to do. Great public spaces produce an energy and enthusiasm that spills over into surrounding areas. By being conscious of this and planning for it from the start, Placemakers can speed up the process of revitalization by making sure that the key places within their district complement each other and great a major regional destination. 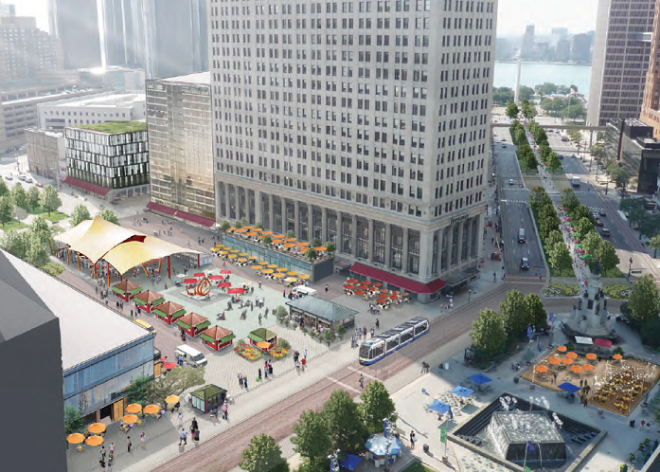 That is the promise of the Placemaking vision for downtown Detroit. It is a grand experiment made up of many small, human-scaled parts: the largest full-scale Power of 10 exercise undertaken yet. And of course, the citizens of Detroit have played a fundamental role in shaping the plan and identifying the attractions and uses that they want to see in their downtown. "The people in Detroit love their city so passionately," says PPS president Fred Kent, who presented the public space plans at Rock's unveiling event yesterday. "It's unlike any other city I've ever been to. When people love Detroit, they really love it. That's what makes it such an ideal place to try something like this. Dan's vision has been to get everyone involved, and tap into that love that Detroiters have for their city. Revitalizing cities around place is all about the community organizing, and his passion for that, and understanding of it, is truly revolutionary." That passion was channeled via a slew of engagement activities over the past several months. This included a series of Placemaking workshops last November and December, and an interactive pop-up "Placemaking hut" at the annual holiday tree lighting ceremony in Campus Martius. This activity was bolstered by interviews and focus groups, input from which was used to create a stunning, detailed report in February that was used by Rock to create the vision plan for downtown, which is available online as a PDF here. (Really, don't miss it!) "We knew that we need public input," says Walker. "You can't just come up with this kind of plan in a vacuum. Now, with so much momentum behind the project, the real thrill will be watching the plan take off in just a couple of months. 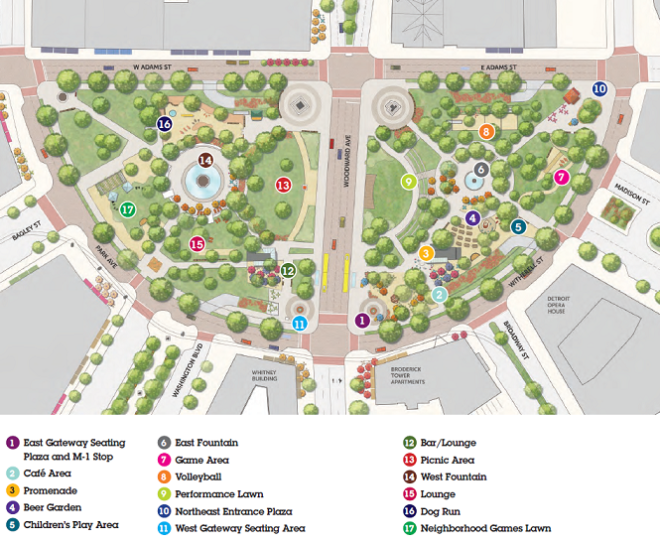 Rock will begin implementing the Placemaking vision this summer via a large-scale Lighter, Quicker, Cheaper strategy that will include installations, pop-ups, and other activities in key public spaces like Cadillac Square, Capitol Park, and Grand Circus Park. This experimental approach will inform the long-term transformation of downtown's public realm. The focus is on re-orienting downtown around the pedestrian experience and making walking a joy. 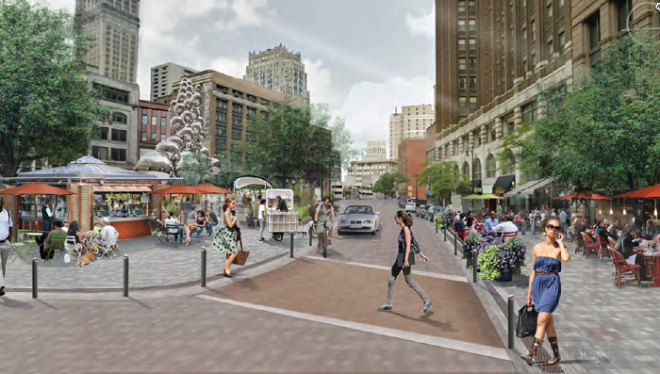 The Motor City, the focus has long been on the streets—and turning Detroit around will require a total re-thinking of critical arteries like Woodward Avenue as streets for people, rather than cars. Or, as Fred put it in his presentation, "We want to create a city where you don't drive through the center, you drive to it." We'll be keeping you updated on progress as Rock moves forward with the implementation of the Lighter, Quicker, Cheaper plan this summer. The process won't only be exciting for Detroiters, but for anyone who sees the potential in a struggling downtown and is looking for a way to transform a whole district. By focusing on creating great public destinations with residents rather than building trophy buildings or designing spaces as showpieces without involving the people who will use them, Detroit has the potential not just to change its own narrative, but to change how cities around the world take on urban revitalization. We'll also be in Detroit in two weeks for the first meeting of the Placemaking Leadership Council, and will have plenty of exciting new info to share with Placemakers afterward. More to come soon!